Presenting a handcrafted Republican Party Christmas tree ornament featuring the elephant logo of the Republicans with authentic Swarovski rhinestones and acrylic stars. 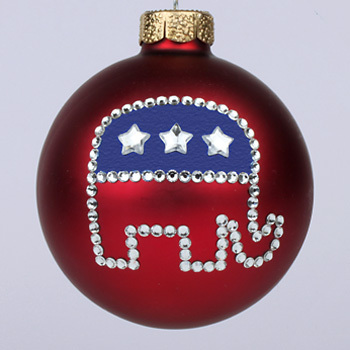 Republican Party elephant Christmas tree ornaments with authentic Swarovski rhinestones can be purchased at Designer Ornaments. Republican Party elephant Christmas tree ornaments depicting a elephant logo can be purchased at Designer Ornaments.